Sure, Eli Manning makes a lot of strange faces but he’s coming off a 300 yard, 4-touchdown performance against the rival ‘Skins. Is he worth a look? 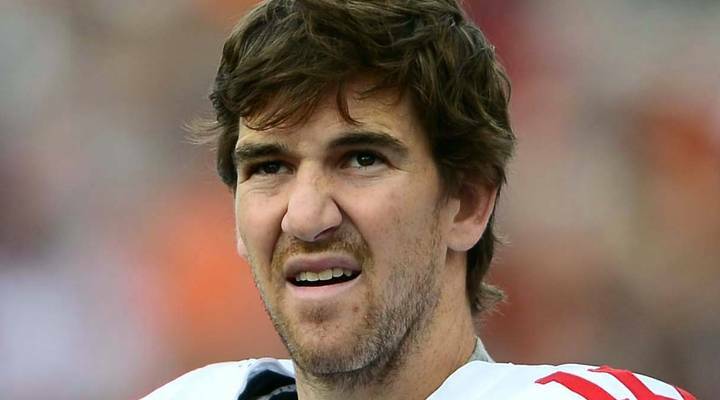 Eli Manning (47% Y! ): He’s always had the weapons to do it but just couldn’t put it together for the first three weeks. On Thursday night, Manning showed a lot of improvement and that he seems to be understanding the new West Coast offense put in place during the offseason. Throwing for 300 yards, 4 TD and rushing for another score is a huge improvement over what he had done the first 3 weeks of the season (674 yards, 5 TD, 4 picks). Having Victor Cruz, Larry Donnell, Rashad Jennings, Reuben Randle and potentially Odell Beckham (might debut this week) is certainly a good set of weapons for Manning looking ahead. Now that Manning seems to be putting it all together, he is definitely worth a roster spot for QB needy teams in the coming weeks. Don’t expect these kinds of monster weeks over the rest of the year as he’s faced weak defensive units but he could be a solid bye week filler option in the future. Teddy Bridgewater (13% Y! ): Teddy Football? I like it. Finally Bridgewater was given the starting job and led the Vikings to a victory over the Falcons, who had destroyed the Buccaneers the week prior. Yes, the Falcons have a very weak defense, but Bridgewater flashed his skills during the game – throwing for over 300 yards while rushing for a score. He seemed to connect with Jarius Wright, who spend a lot of time with Bridgewater on the practice squad. Bridgewater could be even more dangerous in the coming weeks as the Vikings (hopefully figure out that they need to get the speedy Cordarrelle Patterson more involved in the offense. Bridgewater did suffer a sprained ankle in the 4th quarter of Sunday’s game but is expected to play Thursday night against a beatable Green Bay secondary. Jerick McKinnon (16% Y! ): When Adrian Peterson was suspended, a lot of people (myself included) thought that McKinnon would take over as the lead back. This has not yet been the case. Minnesota has used Matt Asiata heavily since the Peterson suspension. However, McKinnon was given 18 carries on Sunday, turning them in to 135 yards. McKinnon has shown over and over again that he is the superior back and sooner rather than later, the Vikings will realize that. Asiata had all 3 TD on the ground Sunday, but that could change quickly as he is better suited as a passing-down tailback. Asiata has a 3.38 YPC so far through 4 games (47 carries for 159 yards) while McKinnon has a 6.17 YPC (23 carries for 142 yards). The window to grab McKinnon is quickly closing. Justin Forsett (41% Y! ): Forsett was used as the primary tailback on Sunday as Bernard Pierce was active but not given a touch. Lorenzo Taliaferro was the backup runner. Pierce seems to have fallen out of favor with the Ravens, no matter what the coaching staff says. Forsett has been very reliable for Baltimore so far as both a runner and receiver. He has a 5.8 YPC (44 for 255) and 16 receptions through four games this season. Taliaferro is going to experience growing pains, as he did Sunday. Forsett is simply the more experienced halfback right now and seems to be in good graces with the Ravens, unlike Pierce. Forsett is a surefire FLEX option, with the potential for RB2 upside some weeks. He needs to be owned in all formats as the Ravens seem committed to using him as the primary running back in the coming weeks. Bishop Sankey (56% Y! ): Entering the season, there was never a question who the most talented back on the Titans was; Bishop Sankey. He has yet to be given the keys to the car through four games and been able to really lead this backfield in touches. Once Sankey corrects his minor issues he should be capable of taking over lead duties for the remainder of the season. He rushed 6 times for 34 yards and a touchdown on Sunday, performing much better than any other of the mediocre Titans halfbacks. Unfortunately, Sankey didn’t play at all in the 1st half and that shows that Tennessee isn’t ready to give him the outright starting job. Whisenhunt should quickly realize that Sankey is their best option in the backfield, especially with a career backup at QB. The Titans will rely on the run more than ever, and Sankey should only see his carries increase moving forward. Scoop him up before he finally does breakout. It’s coming. Eddie Royal (23% Y! ): Is it deja vu all over again? Didn’t we see this out of Royal last year? Back-to-back 2 touchdown games have put Royal squarely on the waiver wire pickup map. There are few reasons that while this streak won’t continue, he is a valuable WR4 for fantasy. When this happened last year, the Chargers running game was established with Ryan Mathews and Danny Woodhead and San Diego turned to them a lot. Also, Rivers was still on the “recovery” path to becoming a great QB again and he basically force-fed Keenan Allen the ball. Now, Rivers is putting up an even better season than he did in his 2013 resurgance. Behind Allen and Gates, there is nobody else reliable for Rivers to throw to and Royal seems to still have some life in him and could be serviceable down the stretch of bye weeks, with the running game sputtering. He will continue to have plays set up with chances to score. You could do worse at WR4. Rueben Randle (62% Y! ): It seems like the Giants offense is finally clicking now that they have had some real game experience in using thw West Coast play calling. Randle was a favorite to breakout this season but failed to do so the first few weeks with Manning sputtering. Now that Manning is looking much better, so is Randle. He was targeted 10 times, catching 8 balls for 88 yards on Sunday. You can expect to see more of those target numbers going forward. Randle is Eli’s third target in the passing game, so the targets should be there. Randle needs to be owned across the board. There’s upside here. Larry Donnell (55% Y! ): Donnell’s 7/54/3 line from this past week says it all. He’s not a fluke. Eli clearly has a connection with this man, especially near the end zone. The Giants’ tight end is my #1 waiver claim this week and one that can be ignored no longer. If he’s somehow still available in your league, change that. Last call here, folks. Heath Miller (62% Y! ): While he won’t put up 10 catches for 85 yards and a TD every week, those lucky enough to have Miller still on your waiver wire should go ahead and give him a look. He is Ben Roethlisberger’s go-to-guy and his #2 target after super-star Antonio Brown. Pittsburgh’s offense is clicking on all cylinders and Miller is a safe option. Running a more no-huddle oriented offense under Todd Haley enables the Steelers to make more plays, which is good for every member of the Steelers. Despite early-season woes for Miller and his fantasy owners, he showed on Sunday that he can be trusted with a big workload and should put up good enough numbers to make him a low-end to mid-tier TE1 in the coming weeks.